Clearly, for much of the SS there can be no redeeming factors. 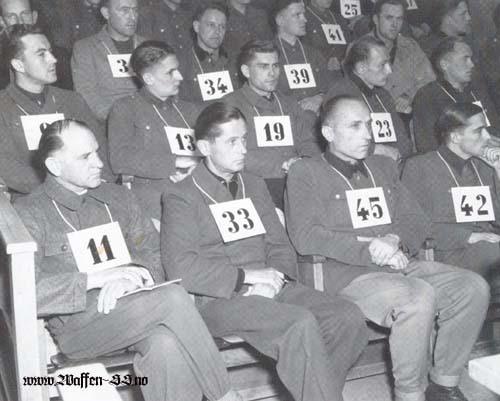 The International Military Tribunal at Nuremberg stated that the ”SS” was utilised for purposes which were criminal under the Charter [of the International Military Tribunal], involving the persecution and extermination of the Jews, brutalities and killings in concentration camps, excesses in the administration of occupied territories, the administration of the slave-labour programme and the mistreatment and murder of prisoners of war.' It also went on to record that the Waffen-SS 'was in theory and practice as much an integral part of the SS organisation as any other branch of the SS', and it was 'directly involved in the killing of prisoners of war and the atrocities in occupied countries. It supplied personnel for the ”Einsatzgruppen”, and had command over the concentration camp guards after its absorption of the Totenkopf SS.' As such, it thus had complicity in the extermination of six million Jews, hundreds of thousands of slave labourers and the murder of untold numbers of civilians in eastern Europe. No one could possibly seek to condone or justify the actions of the Einsatz-gruppen (SS Special Action Groups), the Gestapo, the SS-Totenkopfverbande (concentration camp guards) and others. In addition, it is inconceivable that history will ever consider that it has involved in genocide or crimes against humanity on a divianal basis, but were nevertheless soldiers who were imbued with the tenets of National Socialism and all its hare-brained racial theories been unjust in its treatment of some of the Waffen-SS units, such as the notorious Moslem volunteers or the Ukrainian auxiliaries who served in the police units or as concentration camp guards. Those units must go down as monstrous berrations. Their claim to be soldiers like any others must be rejected absolutely. Those soldiers from the elite units of the Reichsdeutsche Waffen-SS and some of the Germanic volunteers, however, can probably be justified in claiming the right to be considered soldiers like any others, even if this consideration is not accorded to the Waffen-SS as a whole. These troops were not involved in genocide or crimes against humanity on a divianal basis, but were nevertheless soldiers who were imbued with the tenets of National Socialism and all its hare-brained racial theories. That said, for units such as the Totenkopf Division, with, ruthless ideological indoctrination and links with the concentration camps, the waters become murky. Thus the ”classic” Waffen-SS divisions are guilty when it comes to atrocities, or at the very least of collusion in murder. 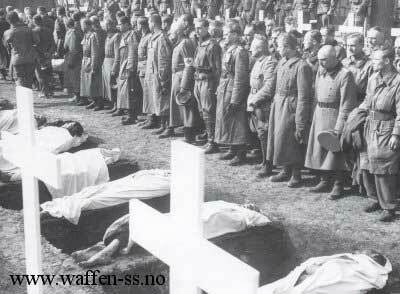 In April 1941 , for example, one of the companies of the Das Reich Division assisted an SS extermination squad in shooting 920 Jews near Minsk. The same division was involved in the killings at Orador-sur-Glane in France in 1944. There are just too many such instances for the Waffen-SS to escape condemnation.